Her name was Naomi. She lived in a town. Since the day that she was born, her mum thought she was too big; and she put her on a diet – forbade her to eat. She lost a few pounds, but still was quite chubby. This mum never gave up though – the goal was her daughter’s “beauty”. Naomi grew up – beautiful and bright, although quite self – conscious and a little shy… She did well at school, though she barely learned; spent most time at home, without any friend. The reason Naomi has become so sad was because she always believed she was fat. Whenever she tried to relax a bit her mum would remind her: “You’re not perfect yet”. She told her to cover her face with a fringe because of tall forehead and face rather big. In her teenage years she was very pretty, although quite unhappy, wishing she was skinny. All she thought about was her massive chest; as she counted calories she hated herself. Finally, Naomi addicted to food let the constant cycle affect her good mood. 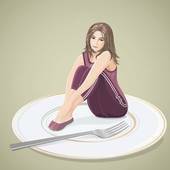 Overeat and vomit, fasting and the rest made her lose control and very depressed. Her weight fluctuated, which has made her ill. She became obese, but this time for real. Naomi was 19 as she left her town. She moved to a city with fearful delight. By the time she started her fresh and new life she was very shy still, which did make it hard. She kept meeting people though and convinced her mind that she should be happy whatever the size. Diets were the lifestyle still, every now and then. She kept losing weight just to gain it back. She wanted to stop, but didn’t know how. Magazines and TV did not help her out. Summer holidays, she travelled abroad and loved what she saw and she saw a lot. Different shapes on different people who seemed loud & proud about slightly bigger sizes and a thicker thigh. Naomi decided she could not go back, and made up her mind to stay where she’s at. Now, she was quite far, in this distant place – far away from mum obsessed with the scales. She thought that was it. She could now start living, but all she could think of was how much she’s eating. She didn’t know why, though she ran so fast, the size 0 town kept haunting her down. She let opportunities always pass her by. She spoke to herself “You’re not slim enough”. She kept getting older and had many fears, she was always worried and often in tears. And then, she fell pregnant with a baby girl. That was the red light she needed – it was time to change. She did really well till a certain time – her mum came to visit from size 0 town. Her mum fell in love with the little one, but kept on repeating that she was too fat. Naomi was angry with comments mum made. She didn’t want her child to go through the same. Mum, please change the topic, this one we’ve been through. Let’s talk about you. What do you want to do? Let’s meet with your friend – that slim girl and tall, always in good shape, always in control. Is she still a model? Do you keep in touch? I hope she is well… So what would you say? … Oh, yes I remember (sigh). The girl’s name was Asia! No mum, she’s not well at all – died from anorexia! Naomi decided she would not be angry. She still wanted though to protect her baby – from size 0 madness and size 0 town that so seriously affected her mum. She made up her mind not to let the size rule over her own, or her daughter’s life. A feel like a lot of us have Naomi’s mother living in our brains!